I am on a serious coat-making kick lately. By which I mean I have made exactly one other coat. I think anything over one is a ‘kick’ though, right? Especially when it comes to more complex projects like coats. The thing I can’t get over is just how amazing it is to sew with wool! I have never tried before because I’ve been intimidated, but it is such a dream to sew and press and mold around seams *gush gush gush*. I also really enjoy the more complex process with all the pieces and interfacing and toggles and pockets, etc. I’m sure those are the exact reasons why some people don’t enjoy coat making, but for me, it is the perfect challenge. Not only is coat making fun and engaging, it also yields really great results. It is much cheaper than buying a coat of equivalent quality in store and it doesn’t look handmade at all. Of course this does depend on fabric choices and finishing details, but if you go all out, nobody would ever guess you made it, unless you’re like me and go bragging about it to everyone you meet. What can I say, I’m in love with my coat! 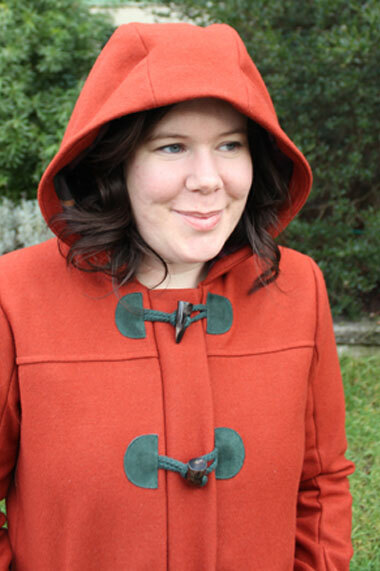 For this project I used the much beloved Cascade Duffle Coat pattern from Grainline Studios. Seriously, is every pattern that Jen makes this perfect? I am making my way through all her patterns and this is another great success. I made a straight 14 and decided not to grade to a 16 at the hips like usual because of the boxy fit of the coat and the finished measurements indicated there would be enough room. The 14 worked out great and everything fits pretty spot-on (which is good because I got excited and skipped the muslin completely). For my next version I might bring the shoulder seam in just a smidge, so it sits more perfectly on my natural shoulder, but it is barely noticeable. The fabric I chose is a dreamy melton wool purchased from Atex Fabrics, and the accents are made from a flannel found at the last Our Social Fabric sale here in Vancouver. It is the same flannel I used for Sam’s Negroni shirt back in the fall. I lined the pockets and sleeves in purple silk, also acquired at OSF, and also used as the lining for my Clare Coat. For the toggles I chose to go with a dusty green leather without a coating on it, paired with a similarly coloured cord. The toggles themselves are made from horn and I got them from Button Button. If you live in Vancouver, you have got to go check out this store, it is button heaven! They had so many toggles to choose from it was really hard, but in the end I liked the natural look of the horn. I decided to add a zipper pocket on the facing so I could have a safer place for my phone and money. I love pockets and this addition was really easy to implement. I just did a basic zipper pocket construction and made the pocket large enough to attach to the armscye so it doesn’t get bunched up inside. Yes, it is huge inside, the more room the better 🙂 I lined the pocket with plaid. Thanks to Teresa from Dandelion Drift for this idea! I also added a small hanging loop to the back, where the hood connects to the back facing. The most challenging part of this coat is sewing on the toggles. I was able to sew through the leather no problem with a leather needle, but it was stressful topstitching down the leather half circles. I am really proud of how they turned out, there is only one spot where I went off the rails a bit and one toggle ended up going on a bit crooked. Not noticeable to anyone but me, and now you because It’s good to share our shortcomings, right? Always room for improvement! Other then those little toggle snafus, I noticed a couple of other things while making this coat. The front band does not want to lie flat on the bottom. This is due to the lack of zipper down there, and leg movement kicking it outwards. It’s not a big deal, but in the photos it was driving me a bit crazy. Also, my facing on the bottom of the coat was hanging down and showing from the back and sides because the lining was just a smidge too long. I decided to tack the bottom facing up in 5 places to stop the facing from folding to the outside. Lastly, I was quite confused by step #52 in the pattern, “Understitch along the facing side of the center front edge catching the seam allowances as you sew”. It makes sense as an instruction but it is incredibly awkward to sew and impossible to get all the way to the bottom corners. I got about 2″ away from the bottom corners and left it at that, but I’m still not sure if I did it right since there is no picture for this step. I am definitely kicking myself for not sewing this sooner, because let’s face it, this is the PERFECT fall coat. It practically screams fall, but it will be here for me next October and you know I’m going to wear it in all kinds of inappropriate weather before then 🙂 I love the idea of making this in a twill like Teresa from Dandelion Drift, or in a water resistant fabric for a duffle rain coat! I have so many ideas for coats and jackets I might just explode. Have you made a coat yet? Don’t be intimidated like me, just try one! Fabric: Melton wool outer, fully reinforced with sew-in welt interfacing. Flannel accents and lining. Silk sleeve and pocket lining. Other Supplies: Leather, cord, and horn toggles. Alterations: Added a zipper pocket to the facing. Thats amazing Helen, love everything about this coat! Thanks for the indie coats above too, will have a look when I’ll decide which pattern to choose for my coat! Your cascade coat is lovely. Well done! Wow, your coat is gorgeous! Brilliant colour choices. I’m about to try my first ever coat (got the Yuzu pattern earlier this month) and seeing/hearing about yours is encouraging me to overcome the fear of cutting into my expensive wool coating. Thank you!! I’m glad it is encouraging you to get started. I love the lines of the Yuzu coat, it looks sooo comfortable. Cant wait to see how it works out! Absolutely gorgeous! I love the color and the plaid detail is just perfect! This is beautiful Helen and you should be super proud of it!! The perfect colour for a duffle coat too! You should totally make a Waver coat – super fun and easy to make, after your last two coat projects it will be an absolute breeze!